Keröbh gifts for a special someone, special occasion, holiday gift, or more. Keröbh is a Premium Artisanal Craft Carob like you have never experienced before. Keröbh™ is a premium artisanal craft carob personally created for you by the chocolatiers here at Relivate, Inc. providing you with carob carefully tempered just for you. Combining a luxurious silky smooth, elegantly melting, rich mouth feel with a nutty sweet aroma and hints of vanilla sweetness, Keröbh™ takes the experience of carob to the next level. Great alone or with the finest wines, cheeses, and fruit -- Keröbh™ is a decadent confectionery delight, perfect for any occasion. And, unlike chocolate, it is naturally caffeine free! Combining a luxurious silky smooth, elegantly melting, rich mouth feel with a nutty sweet aroma and hints of vanilla sweetness, Keröbh™ takes the experience of carob to the next level and its naturally caffeine free! Ingredients: Cocoa Butter, Carob Powder, Nonfat Dry Milk, Sugar, Vanilla, Soy Lecithin (emulsifier). Founded in 2014 by husband and wife team, Stephen and Galadriel Simons, Relivate, Inc is the realization of a vision to take carob to the next level. An avid fan of the finest chocolate -- Swiss, Belgian, English, American, and more -- Stephen first discovered carob as an alternative to chocolate as a child, but didn't seriously reconsider it until a few years ago when, for health reasons, he had to cut all caffeine out of his diet, thus seriously restricting his access to the chocolate he so loved. At first, Stephen joined the average consumers of carob and purchased the carob products already available at health food stores and online. However, he found himself wanting more. And so, after years of buying traditional carob products, in 2013 he started experimenting with making carob. Launched in 2015, Keröbh™ was the result of almost two years of research. 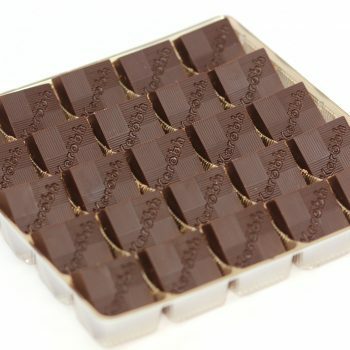 Combining the finest ingredients using our proprietary methods, Keröbh™ is a premium artisanal carob that marries cocoa butter with the unique flavors of carob to produce a luxurious confection that is both delightful and satisfying.